San-A (= three A’s) stores are easy to recognize for their bright yellow and red signs. On Okinawa there are three top-notch supermarkets that you should definitely check out and shop at while you are here. Although each one is slightly different from the other, they all have one important factor in common, which is that they are all owned and franchised solely by Okinawan companies. This means that by shopping at these supermarkets, you are supporting local businesses, the local economy and locally grown and manufactured products. My all time favorite supermarket is called San-A. It’s logo is distinctive in that it is made of three letter ‘A’s. It is by far the best supermarket on the island. Consistent replication of a quality experience can be pretty much guaranteed in each San-A store. 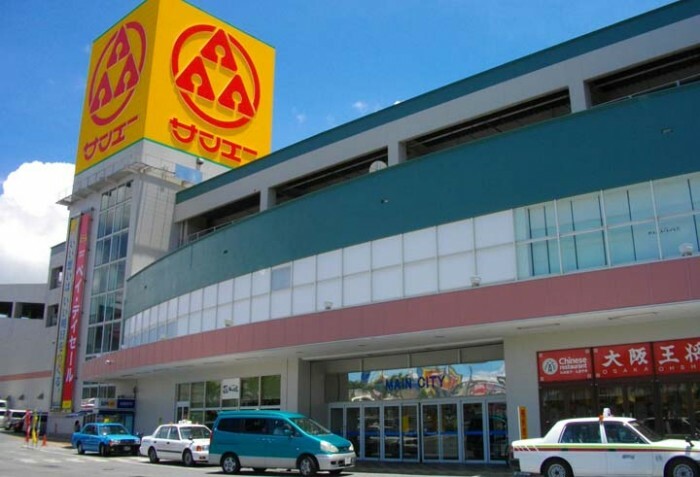 Of the three top supermarkets, San A does have the highest prices on general products but, oddly enough, it has the lowest prices in the liquor department. A highlight in selection and taste can be found in their sashimi section but you will pay a premium dollar for the higher quality. One of the weak points of this supermarket is in their produce area where it is usually over priced and has a limited selection of items that are locally sourced. If you can organize your shopping so that your produce is purchased at local farms while all other essentials are purchased at San-A’s, you may be adding a few years onto your life with the addition of the fresh local produce. Kanehide stores have green trimming. My next choice for top supermarket is called Kanehide. It falls somewhere in the middle in terms of quality. 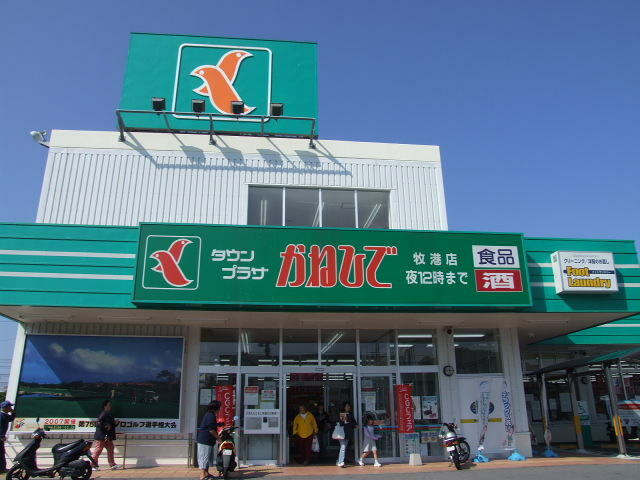 San-A definitely beats out all other supermarket chains in terms of consistency, including Kanehide. The produce and sashimi selection also falls short when compared to that found at San-A. This used to be my everyday supermarket before the new San-A was built in my neighborhood. Now, sometimes when I am at a good friend’s house and we visit his neighborhood Kanehide, I do feel a pang of nostalgia for the place. The bento lunch boxes at Kanehide are their biggest win and definitely the best out of all three supermarkets, even San-A. There is a wider variety of options and they all are absolutely delicious. 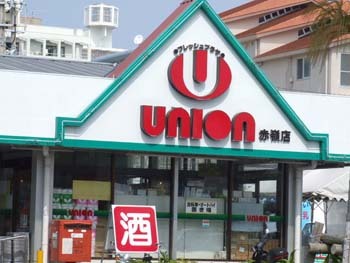 Union stores are the third Okinawan owned supermarket chain. The third supermarket is called Union. It is the most traditionally ‘Okinawan’ of all three chains. This supermarket can often be a hit or miss. Depending on the shop, it may be the most extravagant, organized, stadium-like supermarket or at a shop in another neighborhood, it may be the smallest, cramped and cluttered, narrow-aisled mini-supermarket. It is not easy to pinpoint exactly what is most endearing about this supermarket but the produce is usually reasonably priced. In terms of product, there is no one item that they carry that stands out as extraordinary by any means. I must say that the best part of Union supermarkets is their butcher shop area. If you are a carnivore and love to eat pork, then this is the place to go for your choice of prime cuts. As you approach the butchers’ area, the pungent smell of bleach cleanses your senses and eases you into the butchery proper where you will bear witness to an open display of segmented and chopped up portions of pig carcass. This arrangement is often displayed in a barrel and without a cover. Although I find comfort in choosing my meat swaddled in saran wrap under strong fluorescent lighting, there is an element of respect to be bestowed upon such a display as one can find at the Union butcher shop area. It is a solemn reminder of the way meat had been traditionally displayed for sale when our world was a much simpler place and there was less concern about food poisoning from e-coli bacteria or salmonella. What is consumed and ingested by my body is very important to me as it is essential that it is safe and healthy. This is one of the reasons why my choice of supermarkets becomes a pivotal part of my own daily quality of life. The journey through the supermarkets here can be intimidating so it is my hope that these reviews will also help you with your own navigation through the numerous choices, while encouraging you to make quality, healthy and when possible, local choices when considering where you purchase your food and daily life products. Compare and share my top three choices with your friends and family to see where they sit on their own personal lists. You will most likely find that there will be some disagreement with my choices, which could make for some feisty debate, better product choices, money saving changes and healthier lifestyles in the end for all.